This figure shows the TFP growth rate did slow town temporarily in 2001 but resumed and even picked up its torrent pace for several years. It is also worth pointing out that this surge in productivity growth was both widely known and expected to persist. Productivity gains, then, were the reason for the lower actual and expected inflation. 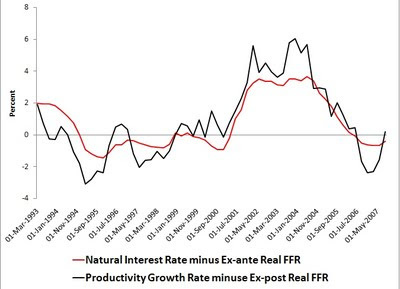 [It is also worth noting that productivity growth typically means a higher real interest rate which serves to offset the downward pull of the expected inflation component on the nominal interest rate. In other words, deflationary pressures associated with rapid productivity gains do not necessarily lead to the zero lower bond problem for the policy interest rate (Bordo and Filardo, 2004).] The big policy mistake here, then, is that the Fed saw deflationary pressures and thought weak aggregate demand when, in fact, the deflationary pressures were being driven by positive aggregate supply shocks. The output gap as measured by Laubach and Williams also shows a near zero value in 2003 that later becomes a large positive value. As Bernanke notes, though, there was a jobless recovery up through the middle of 2003. This can, however, be traced in part to the rapid productivity gains. The rapid productivity gains created structural unemployment that took time to sort out, something low interest rates would not fix. In short, it is hard to argue economic conditions justified the low interest rate by 2003. 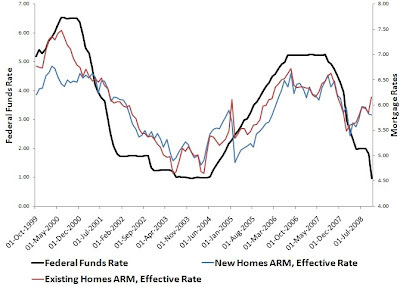 This figure indicates the real federal funds rate was far below the neutral interest rate level during this time. These ECB economists agree. Further evidence that Fed policy was not neutral can be found in the work of Tobias Adrian and Hyun Song Shin who show that via the "risk-taking" channel the Fed's low interest rate help caused the balance sheets of financial institutions to explode. They track each other very closely. Bernanke, however, argues it was not so much the interest rates as it was the types of mortgages available that fueled the housing boom. My reply to this response is why then were these creative mortgages made so readily available in the first place? Could it be that investors were more willing to finance such exotic mortgages in part because of the "search for yield" created by the Fed's low interest policy? The Fed is a global monetary hegemon. It holds the world's main reserve currency and many emerging markets are formally or informally pegged to dollar. Thus, its monetary policy is exported across the globe. This means that the other two monetary powers, the ECB and Japan, are mindful of U.S. monetary policy lest their currencies becomes too expensive relative to the dollar and all the other currencies pegged to the dollar. As as result, the Fed's monetary policy gets exported to some degree to Japan and the Euro area as well. From this perspective it is easy to understand how the Fed could have created a global liquidity glut in the early-to-mid 2000s since its policy rate was negative in real terms and below the growth rate of productivity (i.e. the fed funds rate was below the natural rate). A starting point is that the 1997/8 Asian/Russian crises showed emerging economies the advantage of holding a large stock of international reserves to protect their domestic financial system without IMF cooperation. This self-insurance motive is supported by recent empirical research, though starting in 2002 emerging economies’ reserve accumulation appears to be triggered by other factors.2 I suspect that a prominent factor was fear of currency appreciation due to: (a) the Fed’s easy-money policy following the dot-com crisis, and (b) the sense that the self-insurance motive had run its course, which could result in a major dollar devaluation vis-à-vis emerging economies’ currencies. Calvo's cutoff date of 2002 makes a lot sense. By 2003 U.S. domestic demand was soaring and absorbing more output than was being produced in the United States. This excess domestic demand was fueled by U.S. monetary (and fiscal) policy and was more the cause rather than the consequence of the funding coming from Asia. Conclusion: Bernanke fails to make a KO of Fed critics with this speech. Hi David, happy new year. Given that we still have no conclusion to the various debates about the Gt. Depression, I think we can safely say that we will never ever have a KO in this debate either! But its nice that we are paid to have endless debates about it I suppose. "By 2003 economic conditions did not justify the low-interest rate policy." Provided one accepts the Laubach and Williams estimates of the output gap which are a huge outlier. The CBO's own estimates of the output gap put it at about 2.5% of GDP in 2Q 2003. There is little evidence of much structural unemployment in mid 2003. If the source of unemployment were structural we should see great dispersion between sectors in terms of employment growth. Employment growth dispersion declined sharply in 2003 and fell even further in 2004 to the lowest level since 1988. Not surprisingly, given the lack of disperson in job growth, employers were having little difficulty filling openings. The job vacancy rate plummeted from a high of 3.7% in January 2001 to 2.4% by March of 2003. If there was a lot of structural unemployment why was the job vacancy rate so low? Given that employers were having little trouble filling vacancies it should come as no surprise that compensation was no longer rising faster than productivity as would be consistent with a positive inflation rate target. ULC rose by 2.0% annually on average in the eight years through the first quarter of 2001. In the 9 quarters following that it fell by a total of 1.1%. In the 30 months from January 2001 through June 2003 payroll employment had declined in 25 months. Total payroll employment had fallen by 2.7 million and private sector employment had performed eben worse. It was referred to at the time as the "job loss recovery." More recently Laubach and Williams estimated the output gap in Q3 2009 at only 2.4% whereas the CBO put it at 8.2%. Employment growth (or should I say shrinkage) dispersion is unusually low for a recession, the job vacancy rate dropped to 1.8% as of June, and ULC had fallen a total of 1.9% from peak in 4Q 2008 to 3Q 2009. Nothing in the data suggests much in the form of sectoral imbalances or structural unemployment. I'm sorry but Laubach and William's estimates of the output gap are utterly ridiculous. Maybe I should have said by mid-2003 economic conditions did not justify the low-interest rate environment. But even then, employment is only one indicator of the economy. As I mentioned above AD growth was rapid as was productivity growth throughout 2003. No one would look at these two developments and conclude low interest rates were needed. I know the Laubauch and William output gap measures seem off now, but the large CBO output gap in 2003 seems hard to reconcile with the strong AD growth at that time. (Domestic demand was even stronger.) Moreover, the Laubach and Williams measure allows for short-run changes in potential GDP whereas as the CBO measure does not. Given the rapid productivity gains at the time. On the structural employment question, would an aggregate productivity shock really lead to increased dispersion? At the time there were many stories about firms not hiring labor because of the productivity gains. Robert Gordon has written alot about this. Maybe this is not structural unemployment per se. My feeling is that if one's goal is inflation stability and full employment then productivity shocks should be accomodated by even faster AD growth. Otherwise you will achieve neither. I do not believe productivity shocks necessarily lead to structural unemployment (it certainly did not in 2003). And if there is unemployment that is not structural or frictional, then by definition there is an output gap. The question, Mark, is why "inflation stability" should be a goal at all to the extent that changes in the inflation rate are driven by changes in the rate of growth of productivity. Suppose a slowdown in productivity growth threatened to raise the inflation rate, other things equal. Would it be good policy to restrict demand in order to "smooth" inflation in that case? Most would say not, for good reason. But the case against smoothing inflation in the face of positive TFP growth shocks is hardly less compelling. The treatment of inflation, and of the variability of inflation, as bad per se, no matter what's behind them, is really at the bottom of a lot of bad monetary policy. After all, supposedly "general" inflation movements are really output price inflation movements only; and these movements convey info about the real economy when they are productivity driven, to wit: that output is getting cheaper or more expensive relative to input. Why fight that? Why stabilize output price inflation, only to _de_stabilize input price inflation? 1) If a positive productivity shock is large enough and it is not accomodated by faster AD then this could lead to deflation. This would cause problems for the current conduct of monetary policy with its focus on interest rate targeting. This is of course not insurmountable. I acknowledge it might result in greater macroeconomic stability if we shifted from interest rate targeting to targeting AD (nominal GDP). But this is radically different than the way things currently are run at the Federal Reserve (or anywhere else for that matter). 2) I also have concerns about the stickiness of wages. If a positive productivity shock is large enough and it is not accomodated by faster AD growth then this could lead to wage deflation. In such an environment I can forsee a situation in which relative wages adjust more slowly than normal with all of the associated consequences. This too is not completely insurmountable, however. If one targeted nominal GDP levels as above, theoretically one could avoid this problem by targeting a sufficiently high rate of growth in nominal GDP levels. So, I agree, targeting AD may have some advantages, but only if you try to avoid wage deflation. I'm not sure how this relates to the specific conduct of monetary policy in 2003 however, only because I would need to think this through and I haven't the time just now. Nice to talk to someone who thinks outside the box. Seems to me the problem with blaming the low Fed funds rate is that in the early 2000s the Greenspan Fed was primarily concerned with deflation. Moreover, they had a good reason for this. Remember that the Chinese currency peg generates inflationary pressure in China but deflationary pressure in the US. Seems perfectly likely that had the Fed tried to fight the housing bubble with higher interest rates we might have just ended up with high unemployment and a long grinding deflation that might not be any better, and could be worse, than our present situation. For Mark: Although the concern about the zero bound problem is a valid one, it's important to realize that positive TFP growth rate shocks tend to go hand-in-hand with higher real neutral interest rates. So holding AD growth steady in the face of such shocks should not increase the probability of hitting the zero bound: the equilibrium nominal rate itself stays more-or-less unchanged under a productivity-norm (no accommodation) policy. Thank you for your second response. "it's important to realize that positive TFP growth rate shocks tend to go hand-in-hand with higher real neutral interest rates." My intuition tells me that it is true but I personally have no research or empirical evidence to support that conclusion. Show me. 2) I'm still thinking about your second counterargument. I'm not sure I buy it (but I'm open to reason). I would like to see your response to my first argument before I state anything firm. OK, Mark; here goes: Consider that any increase in TFP growth is an increase in the real return on capital. It follows that any increase in the TFP growth rate increases the opportunity cost of capital to a like extent. Therefore, if I was willing to lend at X% when the TFP growth rate was Y%, I would surely insist on (X + Z)% when the rate increased by Z percentage points, right? All the terms here are real, of course: there's no appeal to any money illusion. It probably won't suprise you that George and I both favor a nominal income targeting type rule for monetary policy. Some of the questions you raise I address in this article . See also George's monograph. I'm thoroughly convinced by both of your counterarguments. However I still think there was justification for the loose monetary stance in 2003 because nominal GDP growth had fallen below trend in the previous two years. Furthermore there was a moderate output gap in 2003 in my opinion. I've become a huge fan of the targeting of nominal GDP levels in the last year thanks to the obvious failure of conventional monetary policy. I'm happy to see that there's a lot more of us than I initially thought. Euro Skeptics: Bad Analysis or Bad Timing?